To be good at marketing project management, you require a unique set of skills. Type A; organized; on-top-of-it… these are just a couple that come to mind. Some skills that make for great project managers are innate – they’re personality characteristics that typically can’t be taught. Others include soft skills which can be honed and improved over time. For marketing managers specifically, you’re managing projects, planning campaigns, reporting on results, keeping budgets in-line. The list is never-ending, really. Your skillset is extensive… that’s for sure. Problem is, project management is typically a bonus task that is tacked on to a marketing manager’s already packed job description. And it’s rarely something that marketers easily get the hang of. BUT… it’s not your fault. 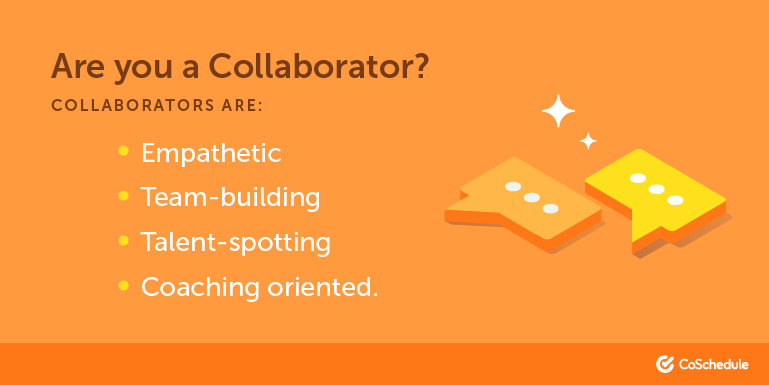 Chalk it up to siloed teams, communication hurdles, 8 bajillion disconnect tools… all of which make collaboration and managing projects far harder than it needs to be. It’s high time to end the marketing project management struggle. This post takes a deep-dive into all the project management skills you need to be a great project manager; the tools needed to help accomplish your project management dreams; and even a few courses to brush up on how to become a better project manager. If you’re looking to manage your marketing projects better, take a look at this Agile marketing project management guide. 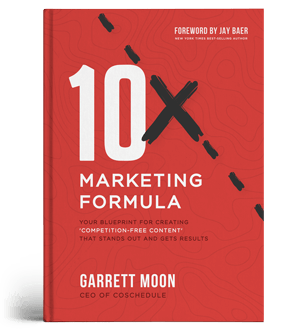 It’s specifically tailored to teach marketing teams everything they need to know about how to adopt the Agile methodology to their marketing projects. Communicate with your team better. 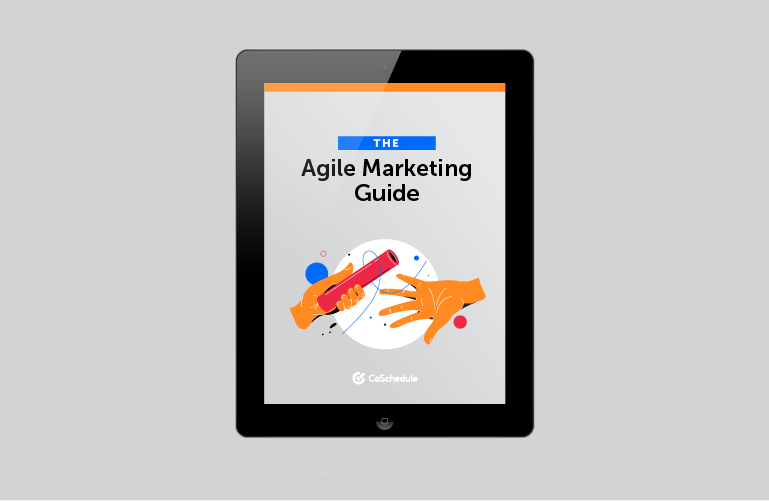 Download the Agile Marketing Guide. Let’s explore an (almost) comprehensive list of all the skills a project manager needs, as well as training opportunities, tools, checklists and other must have items for each skill set. First and foremost, project managers need to have great leadership skills. This kinda goes without saying considering a project manager’s main task is to lead projects. However, other items also make this skill essential to the area of project management. Those who are skilled leaders set the vision for the project, motivate the team, and make themselves available to solve roadblocks and overcome hurdles. Many marketing project managers find themselves balancing between two stakeholder groups – the operational and the strategic. From a leadership perspective, marketing project managers must gain the trust and c-suite level buy-in necessary to bring a vision to life. From an operational perspective, marketing project managers must exhibit leadership skills when introducing new tools, enforcing project timelines and ensuring that everyone on their team is rowing in the same direction, toward the same goal. According to the Harvard Business Review, there are six different types of leaders. Knowing which type of leader you are will help you identify your own blind spots, how you can improve as a leader, and what value you bring to your team. Those with the collaborator leadership style are humble and perceptive about the needs of others. You place the needs of the team above all else. When leading your team, you are supportive and help your colleagues professionally develop by placing them in positions where they can excel. You share credit for team success with all members. Are good at attracting and developing talent within your team. You are perceived as supportive, caring, and empathetic. You might be overlooked for promotions since you’re shy about showcasing your successes and view success as a team effort. Holding a firm line with subordinates. Energizers are particularly skilled at seeing the “big picture”. These individuals build enthusiasm and are good at inspiring others within their team. Energizers are great at turning around low morale with their charisma, but can inadvertently steamroll others with their strong opinions and outgoing personalities. Are cooperative, positive, and team-focused. Seem relentlessness and forceful in presenting your ideas. Help team members find purpose and meaning in their tasks. Patience – you want ideas and change to happen at a breakneck speed. Better understanding and analyzing the risks associated with your ideas. Toning it down – some team members might find interactions with you exhausting. Pilots are out-of-the-box thinkers that are good at navigating ambiguous, ever-changing environments. These individuals are talented at creating long-term strategies and translating them into action. You are a great collaborator and relish in a good challenge, but coworkers can find you unrelenting at times as you push hard and have high expectations. Push your subordinates to achieve great results. Are extremely driven and often are one of the last ones to leave the office. Enjoy owning and driving your projects and initiatives. Hate being controlled or micromanaged. Trouble listening and valuing other viewpoints. Stepping back and letting other lead. Providers are driven to care for people around them. Your conviction and loyalty are appealing and inspire others on your team. You often believe that your strategy is the only correct way forward, which can lead to insular thinking and inability to see other, valuable strategies. Your team probably sees you as caring and thoughtful, but also inflexible and hard to convince. Are considered deeply caring and thoughtful. Make others feel like they belong. Often form clearly defined, strongly held points of view. Difficulties with changing your actions based on feedback. A tendency to overlook the day-to-day minutiae. Lack of accessibility – people find their relationships with you one-dimensional. 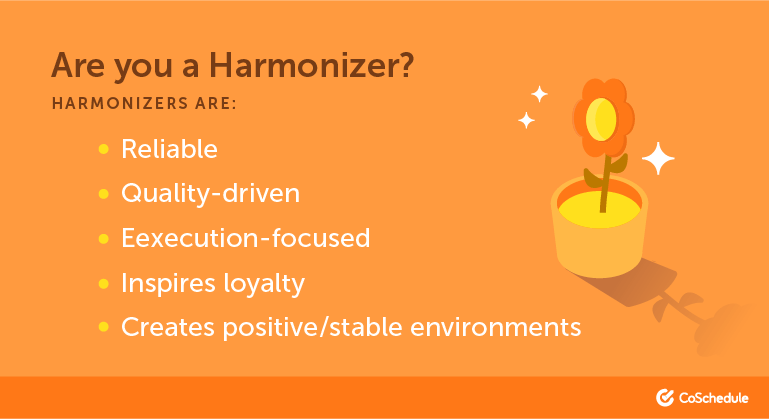 Harmonizers have high standards for quality and are good at creating environments where coordination and execution thrive. You are effective at spotting problems but typically focus on “by the book” solutions. Colleagues may characterize you as “steady eddy” as you are supportive, yet cautious when it comes to change. You are good at creating repeatable processes for better execution. Expect project output to be perfect or of high quality. Value predictable and reliable environments. Are exceptionally good at managing the day-to-day operations and adherence to process. Inability to focus on the “bigger picture”. Trouble delivering tough, constructive feedback. Forecasters are data nerds. They love expanding their knowledge and becoming subject-matter experts. These individuals are especially talented at reflecting on how events affect business and project outcomes. You aren’t necessarily charismatic, but coworkers find you to be a visionary. However, you are often slow to implement new ideas, as you like to see data before acting. You live by the “ready, aim, fire” approach. Value intellectual ideas and arguments. Enjoy using data to improve products or processes. Prefer to have deep knowledge in one area vs. broad knowledge on many topics. Low tolerance for risk makes decision making difficult. Easily become overcommitted to an idea. Leaders with Producer traits value tangible results above all else. You like to see cold, hard numbers that reflect good performance. These individuals are highly pragmatic, but usually prefer to take approaches that have been proven effective, rather than implementing radical, new ideas. Value a good work ethic and consistency. Are skilled at building efficient structures. Prefer to operate in a hierarchical organization. Have an ability to tune-out external noise and focus on what needs to get done. A tendency to be too rigid in your beliefs. Potential to stifle subordinates’ professional development. May be perceived as uninspiring, detached or antiquated due to your unwillingness to try new approaches. Leaders with Composer traits have strong intuition and a unique ability to blend creativity with logic. These individuals prefer to operate independently – making collaboration challenging. 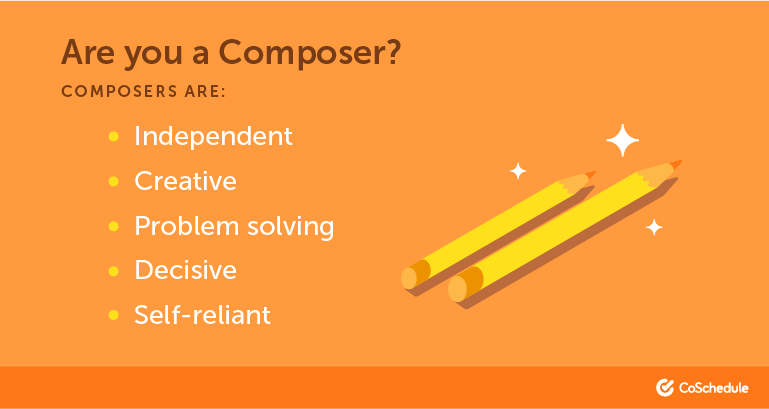 Composers have a tendency to keep prefer to do the work themselves and have trouble delegating tasks. The adage “if you want it done right, do it yourself” rings true to these individuals. Respond well to new market data or research. Enjoy direct control over projects and deliverables. Are good at creating and sticking to boundaries with coworkers. Trouble communicating your ideas and gaining buy-in. View the emotional sides to leadership as distracting. Building productive relationships and lead high-functioning teams. Developing bonds among team members. Manage and exceed stakeholder expectations. The next skill that is necessary for project management is the ability to negotiate. Project managers are often in a continual state of negotiation – from hammering out the initial scope of the project with c-suite stakeholders, to negotiating the daily ins-and-outs with project team members. But keep in mind, negotiation is really just two-way communication with the aim of finding a mutually beneficial solution to a shared problem. Here’s a course specifically designed to help project managers improve their negotiations skills. How to plan, execute, project negotiations with stakeholders. How to collaborate with team members better. How to determine the appropriate influencing approach. About 75-90 percent of a project manager's time is spent formally or informally communicating, according to PMI's Guide to the Project Management Body of Knowledge (aka, PMBOK). Likewise, up to a third of project managers identify inadequate or poor communication as a cause of project failure. Good communication skills might be the most important skill any project manager can have. Thing is… communication is basically baked into every other skill included on this list. Leadership? Definitely encompasses good communication. Negotiation? Yep. Problem-solving? Oh yeah. With such a broad topic, how can it be boiled down to one succinct skill? Truth is, it can’t. BUT, two good places to start are by working on your presentation and listening skills. Presentation skills help with everything from preparing a pitch to clients and stakeholders; to reporting on status and results. Eases anxiety about project progress. Provides clarity of your points so there’s less friction to achieve project goals. Regarding listening skills, you might be thinking this is the opposite of communication because communication is all about getting your point across. Why is listening so important to project management, you ask? For starters, lack of listening skills can lead to mistakes and ineffectiveness – which, in turn, can cause missed deadlines, faulty outcomes and scope creep. Lack of listening skills can also contribute to a feeling that the person is missing interpersonal skills, in addition to listening skills. Warren Buffet claims that good presentation and public speaking skills are the number one skill anyone can have. In fact, the famous billionaire actually took a similar public speaking class from Dale Carnegie to overcome his fear of speaking in public and to become a better communicator. Take a look at this course called “Inspired Presentation Skills” from Dale Carnegie. It covers things like how to persuade colleagues, selling to a client, and energizing a team. Project managers need to be organized. Which is usually a heck of a lot easier said than done – especially for marketing project managers. You’re trying to stay on top of the day-to-day minutiae, getting status updates, pulling data, updating stakeholders, compiling presentations and planning meetings. No wonder it’s hard to get organized. It’s also further complicated by a bunch of disconnect tools and spreadsheets that no one else on your team can decipher. In theory, project managers know they need to be organized, but the odds are stacked against us. Here’s the thing… simply implementing the right tool can increase your organizational skills and make your work life as organized as the rest of your life. Enter CoSchedule… it has a host of project management features designed specifically for the needs of marketers. From Kanban views, to task management dashboards that can make status updates things of the past. Heck, CoSchedule even has social media publishing capabilities, email marketing integrations, reporting baked in – so you can consolidate a ton of your marketing stack into one, easy, platform. It’s not a question of if your project will encounter a problem, but when. Nearly all projects, at some point in their duration, will face a snag of some sort. Whether it’s small, like a team member out sick, or large, like a big chunk of work needing to be re-done, having good problem-solving skills is beneficial to all project managers. Being a good problem solver is usually filed under one of those character traits that is difficult to teach… some people are just born to be good problem solvers. If you don’t feel this is you, but you’re working (or want to work) as a project manager, fear not. 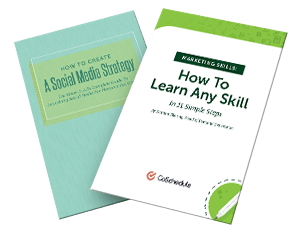 There are some ways to hone your skills. For starters, consider the problem as a gap between where you are now and where you want to be. This gap is filled with things that led to the current situation. A good way to visualize this is by using a fishbone diagram. Fishbone diagrams help you focus on fixing the root causes of the problem, not just the symptoms. Project management depends upon delegation, but delegation can be a scary thing for perfectionists. You want the tasks to get done on time and to a certain standard. So you desperately want to just do it all yourself. Fact is, one cannot be all things to a project or a business… you’ve got to delegate in order for your project to be successful. The good news is, with a solid roadmap, documented workflows and task approvals, you can settle your nerves and start delegating without fear. Delegating has never been easier than with CoSchedule. Start by adding tasks so everyone in your project knows exactly what their role is and when their contributions are due. In CoSchedule, open a new project. 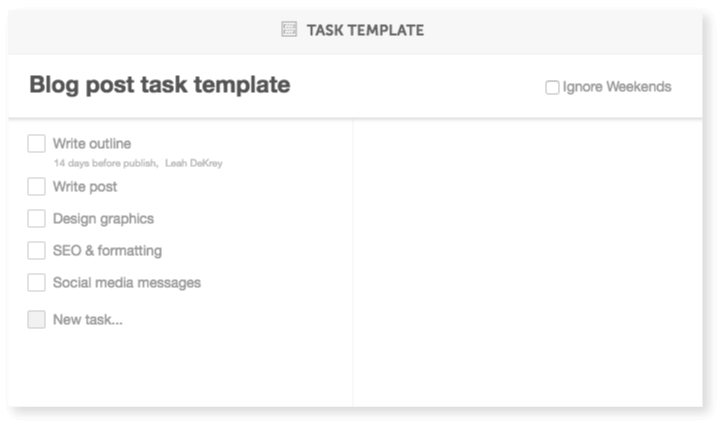 Then select the task template icon in the right-hand corner. Then choose to create a new task template and name your task. 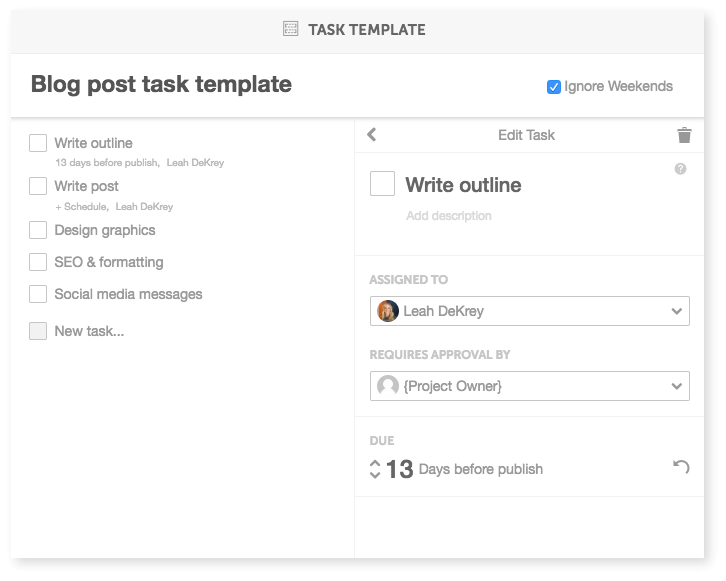 Next, add all of the tasks that need to be completed before your project can launch. Assign the task to an individual and set a due date based on number of days before launch. 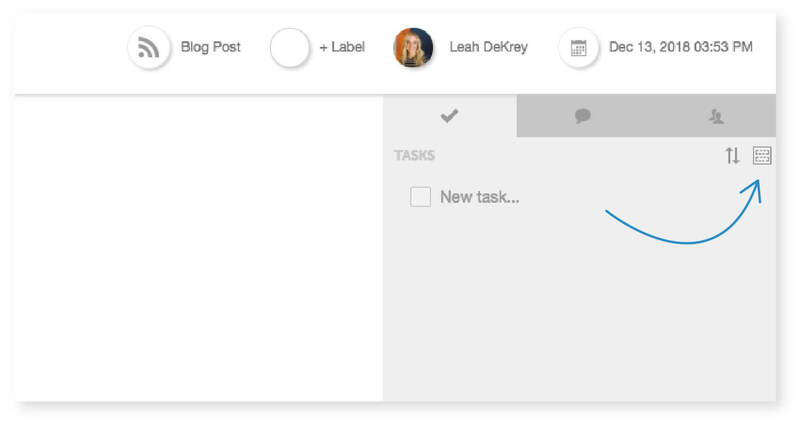 You can also add task approvals, so individuals are notified when a task is completed and is ready for their approval… making delegating even easier. Now you can auto-assign tasks for all future projects with the click of a button. Project managers can benefit a great deal by having good coaching skills. Sure, you’re the one responsible for the project’s activities, timeline, delivery, etc. You’re also responsible for the individuals who are contributing to the project. Being an effective coach helps your team members achieve both their individual, professional development goals, and also increases the likelihood of a successful project outcome by turning an average team into a high-performing one. When access to coaching, team members are more likely to take on additional tasks for the team. Knowledge transfer from coaching helps decrease project risk. Minimizes losing key resources within the project. This “Coaching for Managers” course helps participants develop the essential skills to coach team members to perform at a higher level. The course is offered by The University of California Davis and focuses on best practices, research, tools and models for effective coaching. You will learn how to use coaching theories to establish expectations and increase accountability, as well as how to constructively approach situations to improve performance. Like it or not, priorities shift. It’s a natural part of office life. How you, as a project manager, respond to shifting priorities is as much an art as it is a science. You’ve got to be able to quickly figure out what is most important to the organization or client and kick it into gear as efficiently as possible. What are some easy ways to improve your prioritization skills? To start, make sure everyone on the team is privy to the project schedule. 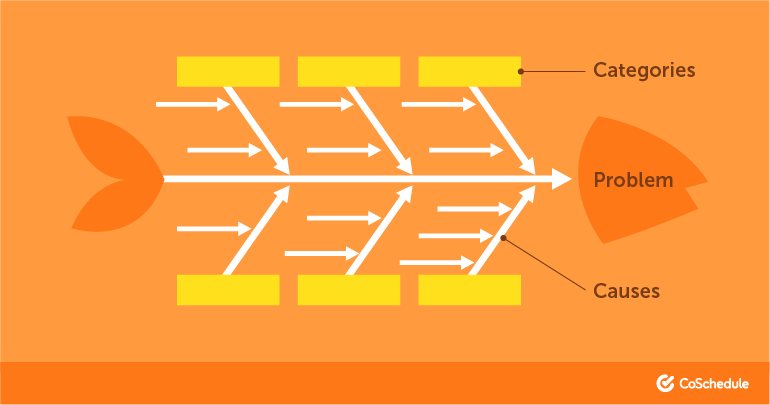 This helps all your team members understand how each element works together and how their work will be affected if an early shift causes a ripple effect or the plan to go pear-shaped. As far as staying on top of individual priorities, use a collaborative project management tool like the Team Management Dashboard in CoSchedule. It lets everyone know what their daily priorities are for ultimate project visibility. Because project managers wear a lot of different hats. They’re a lot of things to a lot of people, and expectations are high. Now you know all the skills needed to become a better project manager, how to improve ‘em, and how CoSchedule can help. So why not hop in a CoSchedule and give it a try yourself? It’ll help your marketing project run smoothly and help your team collaborate more effectively.